I was waiting with publishing my post on Eritrea for months now. I wasn’t sure if I should focus just on my in-country experience, as after I included some fact on the actual situation in Eritrea on my Instagram posts, I apparently made some Eritreans feel uneasy. Some people didn’t like the fact that I talked about the bad situation in Eritrea instead of just focusing on only the good parts I experienced as a visitor. Because let me be clear, Eritreans are wonderful people and their country is beautiful. That said, I decided that in order to give people a glimpse of Eritrea I need to talk about both aspects. After all, if I didn’t I probably would have offended others who’d say that I’m not talking about a bigger picture. Eritrea is one of the most mysterious countries in the world. Most people don’t even know about its existence, or what’s really going on inside the country. Media also rarely reports on the in-country situation, with the exception of last week’s news. 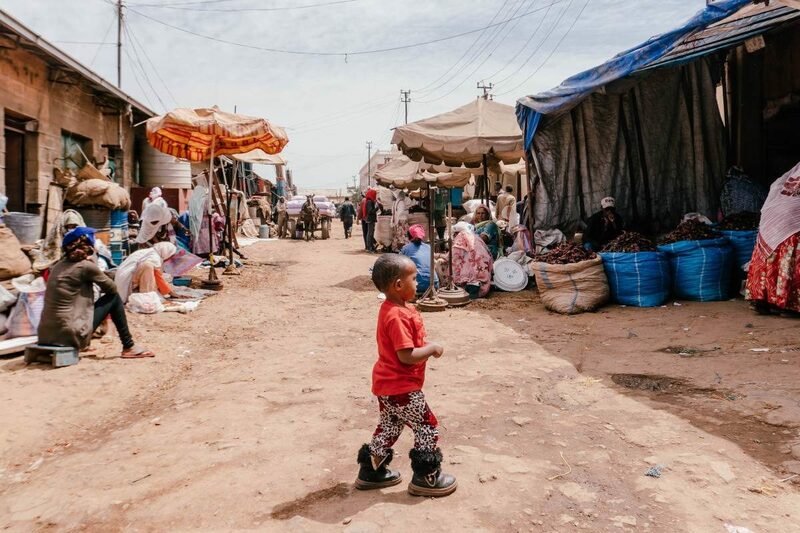 For 2 decades, little besides soldiers, refugees and rebels moved across Ethiopia and Eritrea’s closed border, but today the once-barren no man’s land teems with activity. If you Google Eritrea, you generally won’t find much information about it. If you check news sites, there will be just a few articles about Eritrea, mostly covering the difficult situation of the Eritrean refugees abroad or the concerns regarding human rights there. 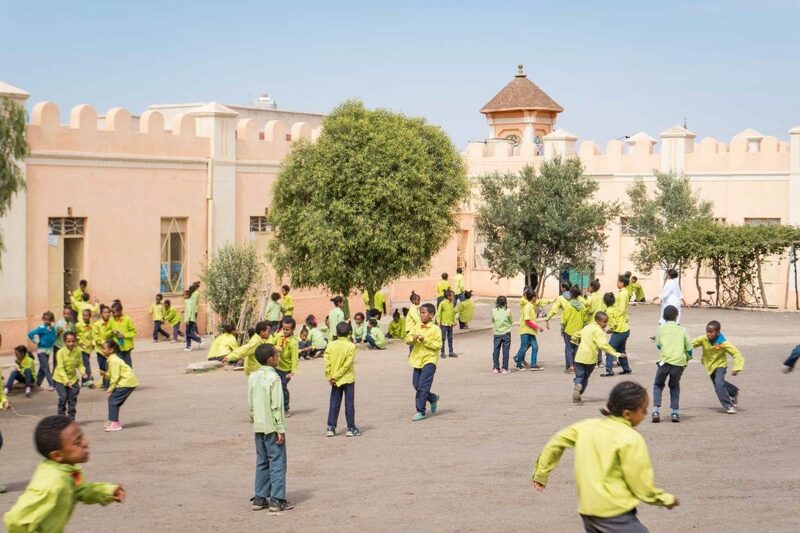 Primary school in Asmara, Eritrea. Despite the lack of news one thing is clear – Eritrea is not Wakanda, it’s actually the opposite. It has the highest amount of refugees in the world, with over 1000 people leaving the country every month and 80% of Eritreans not happy with their life situation. With the country not actually being at war, one should ask why? However, most people rarely ask about Eritrea while the world’s attention is focused on countries like Syria, North Korea, or Palestine. Ironically, the situation for Eritreans is often worse. Not without reason, the HRW calls Eritrea the North Korea of Africa. I’ve been intrigued by the lack of information about Eritrea, and the research proved to be the toughest I’ve ever done on any country. Almost all academic books published on Eritrea are written by researchers who have never actually visited Eritrea. When I attended a lecture on Eritrea at Georgetown University the professor showed us a documentary on Eritrea, but neither the professor nor the producers of the documentary ever visited the country. Meghan Markle advocated for the situation in Eritrea at One Young World, but also never made it to Eritrea. It stunned me that the majority of researchers and advocates based their information on relations from Eritrean refugees and no one ever tried to enter the country, undercover or not. Based on my past experience working on women’s rights in Mexico, I knew that when it comes to topics concerning human rights, we can often experience a discourse between academic research and practical in-country investigation. I made it my mission that if I’m ever to speak on human rights issues in Eritrea, I need to see the full picture. I had to see Eritrea with my own eyes, so I stayed quiet about the trip in order to obtain a visa. It’s not easy to travel to Eritrea and even harder to travel around Eritrea (and it actually became even harder after I left the country), but thanks to traveling in a group I experienced almost no issues. 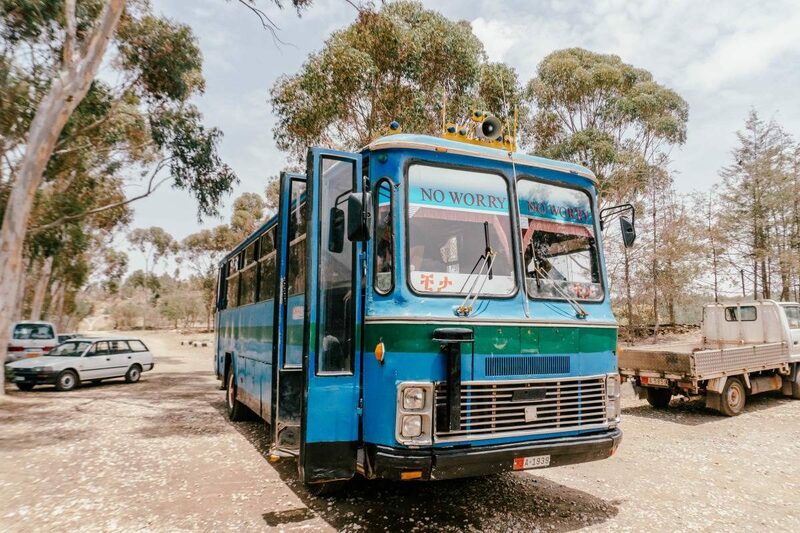 The bus we traveled in around parts of Eritrea. After what I saw, learned and knew from other sources, if I had to describe Eritrea in one word I’d say ‘complicated’. 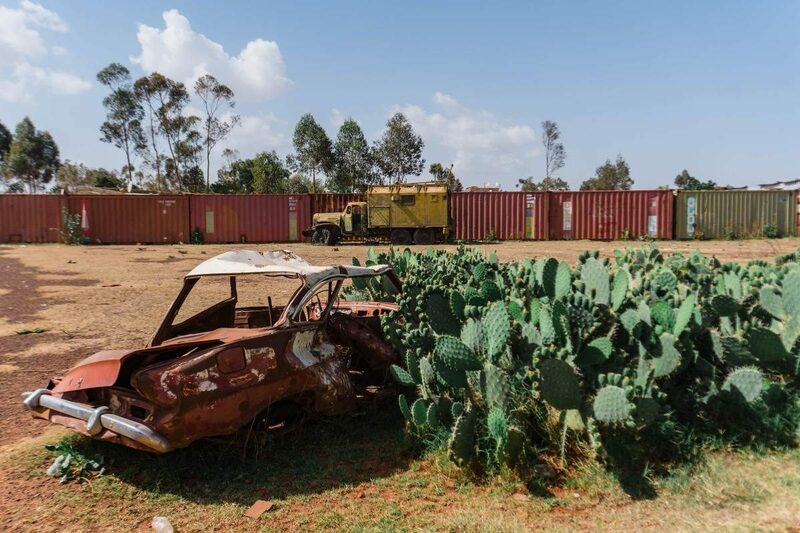 Any researcher will tell you that Eritrea is one of the most isolated and repressive countries in the world, with young people having no future. Their choice is to undertake compulsory national service or try to flee. 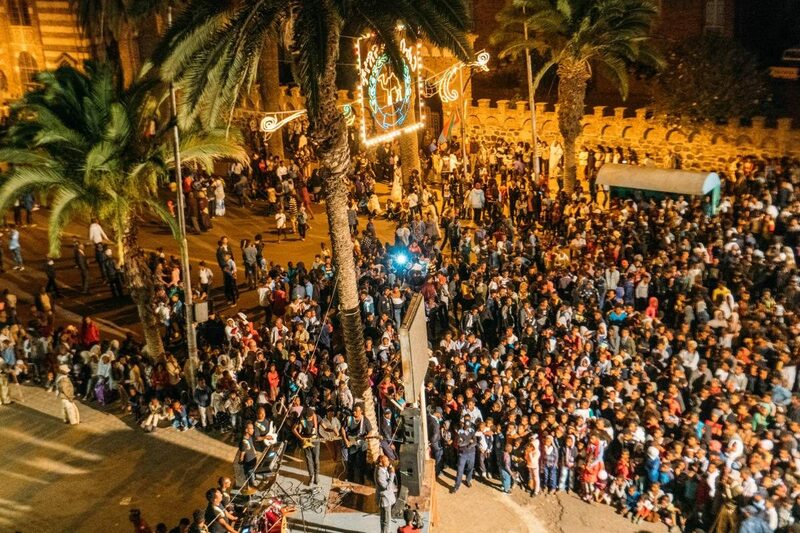 If you don’t do your research beforehand and go to Eritrea because you want to tick all the countries from your list, or visit ‘difficult’ countries, as a tourist you will experience a sugar-coated experience. But is Eritrea isolated in terms of access to information and situation outside of Eritrea? Not anymore these days. Definitely not as much as Iran or Cuba. 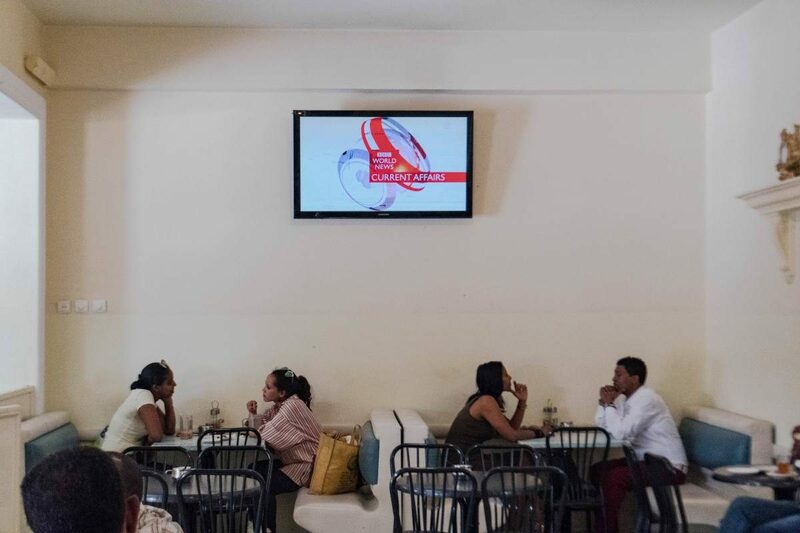 In cafes in Asmara, you can see BBC World News or CNN being on most of the time. 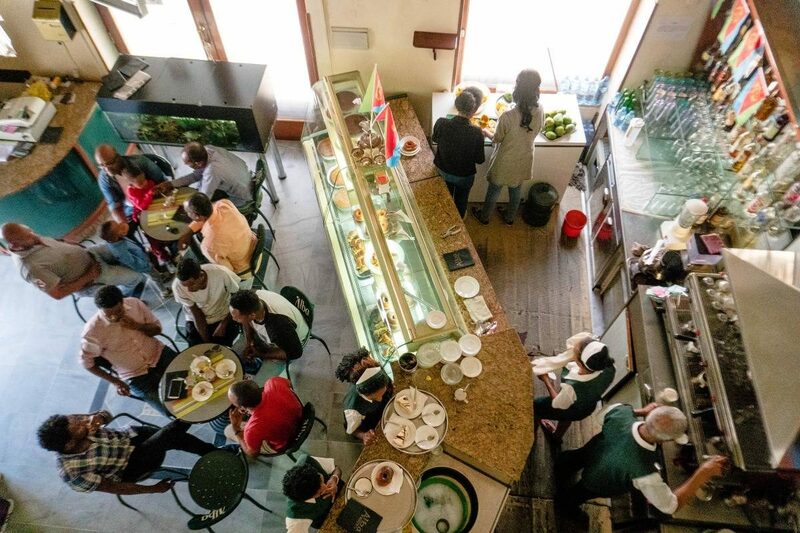 While Internet is not as widely available as in the Western World, there are many cafes that are always full of people. While it’s incredibly slow and certain things work for certain devices (for some reason I got everything to load and once after 20 minutes I was even able to upload a photo to Instagram), locals mostly watch movies and videos there. Local guides will never admit to you what’s actually happening. They’re hired to tell you things the government wants tourists to hear about Eritrea. For instance, Eritrea has a compulsory national service for men and women. Conscripts often work 72-hour weeks in extremely harsh conditions with inadequate food and low pay. No one can legally take a leave, which depends on the whim of commanding officers and some report going years without being allowed to visit home. If a conscript fails to return after taking leave, their parent may be jailed until they do. And by jail, it often means a shipping container in the middle of nowhere which one guard actually informally admitted to my group. 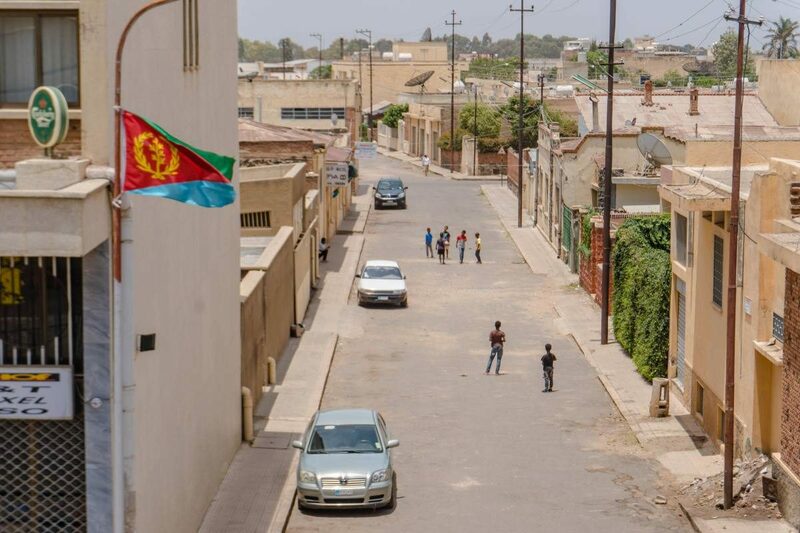 To tourists and outside Eritrea, the national service is known to last about 1 to 6 years. I kept asking locals about the length of the national service and every time I was receiving a different answer. 2 years, 5 years, 10 years, 27 years. My local guide, as friendly as she was, claimed that the service lasts 1 year and everyone WANTS to do it to learn about the military. I don’t blame her for not telling me about something that could get her in trouble. One person from my group asked me: why do you keep asking this question about the length of military service? Simply because I wanted to see how many people are willing to open up. Some did, mostly those who lived abroad, got another passport, and returned to Eritrea many years later. One man I spoke to, after he realized that no one around him spoke English, told me that the national service can keep you as long as they want to keep you there. They pay every person a ration of 1000 nakfa per month, and to put this into a perspective a dinner at the restaurant costs 120-200, while a small bottle of water in a store is 12 Nakfa. Not without a reason their national service is not only described by UN and Human Rights Watch as non-community voluntary thing but often slavery. Tank graveyard near Asmara, Eritrea. People who guard this graveyard live in those containers in the background. Can People Flee Eritrea Then? As Africa’s most secretive state and the source of tens of thousands of migrants who have fled towards Europe, fleeing often isn’t as easy. Even if someone gets out of Eritrea, that could be just the beginning of their troubles. The kidnapping of refugees is happening way too often in countries neighboring Eritrea. You won’t read about in the news apart from very rare articles, but there are various organizations helping families of kidnapped women and girls pay the ransom required. If no one pays, they get raped and tortured over and over again. If they happen to make it all the way to Israel, they often get deported to Rwanda. Even as a tourist in Eritrea, you shouldn’t expect luxury. Hotels are very basic, but with normal beds and hot water in the shower. My hotel in Asmara even had air conditioning. Many locals don’t have the same privileges though, especially those living outside of Asmara. Asmara vs the rest of the country gives an impression of a capital vs the districts in Hunger Games. The capital has beautiful buildings with modern Italian architecture and perfect asphalt roads. There are some cute restaurants, colorful ice cream stores, gorgeous cinemas and I even went to a bowling alley (human/kids operated, but still a bowling alley). It’s very different from most African cities. The moment you leave the capital you can see how most people truly live. You’ll see houses made of clay, people living in tiny houses, often partially destroyed. As I saw first-hand, quite often four women can share one room despite having a job and working more hours than we might when working full-time. 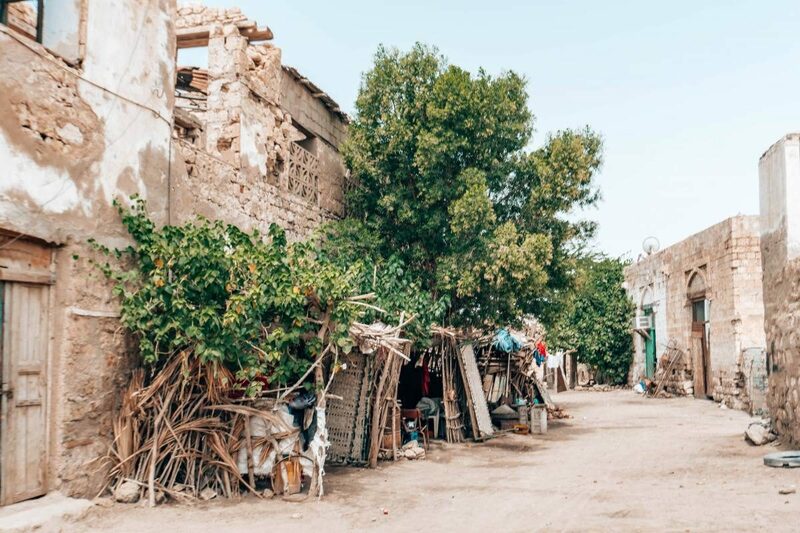 Strolling through the town of Massawa, you can see how gorgeous it used to be, but a lot of it got destroyed during the Eritrean War of Independence from Ethiopia, as The Battle of Massawa was very brutal. Ethiopians used napalm bombs bought from Israel to bomb civilians and the city. Some of the Massawan coral buildings are still standing, but a gorgeous Turkish bank got bombed and mostly destroyed. There are still people living in the old town, using the remaining buildings as a shelter. Don’t think that despite hard living conditions locals don’t try to enjoy their lives. They make the most of everything and it’s quite refreshing to see. On a Saturday there were so many locals on the beach in Massawa, playing games and enjoying themselves. This pet camel was there for everyone to take photos with before it went home apparently. While after visiting several African countries I must say that Eritreans are some of the friendliest people I’ve encountered. 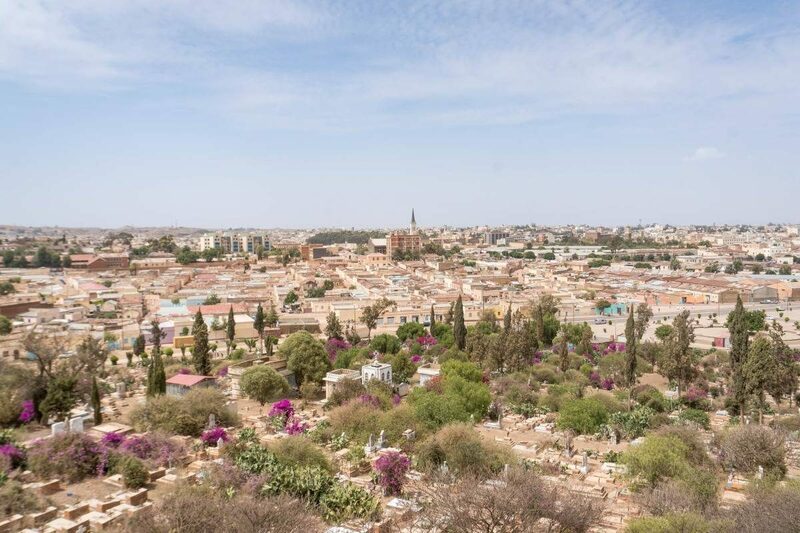 I felt it from the minute I got on a plane to the capital Asmara where I was the only tourist. I immediately felt welcome and could sense a community between fellow Eritreans who were coming to visit their motherland. Meeting a friendly camel in Eritrea. When visiting Keren for a special religious festival, I sat down with a group of guys from my group. When a local family saw that we had nothing to picnic with, they immediately shared their bread with us. Another person offered us coffee. They didn’t want us to sit there while they were eating, even though they didn’t have much themselves. Another day my friend and I got caught in the rain. 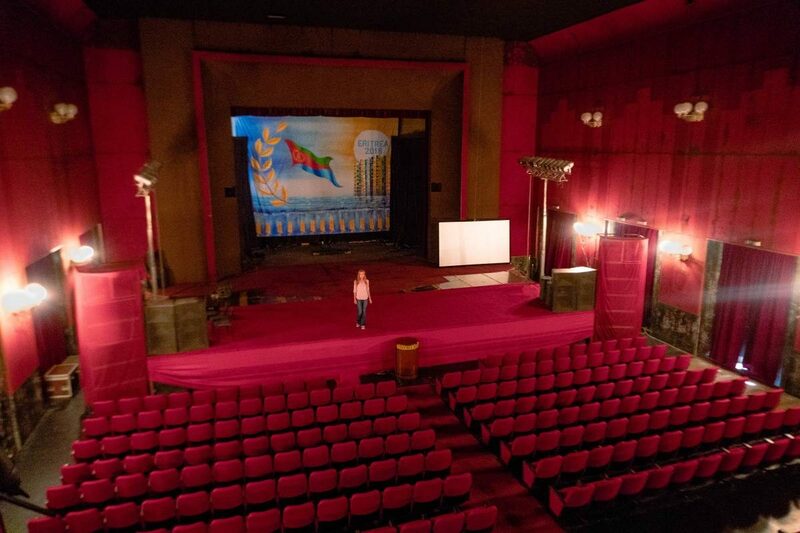 We were hiding under the roof of a closed cinema when two girls waved at us and invited us into their home and offered coffee. With the little English they knew, they told us their stories and wanted us to feel welcome. These gestures were so simple and human, yet, in the Western World they’ve unfortunately stopped being normal. For example, when was the last time you invited a stranger into your home from off the street? That said, despite the situation Eritrea is a beautiful and amazing country in a tough situation. 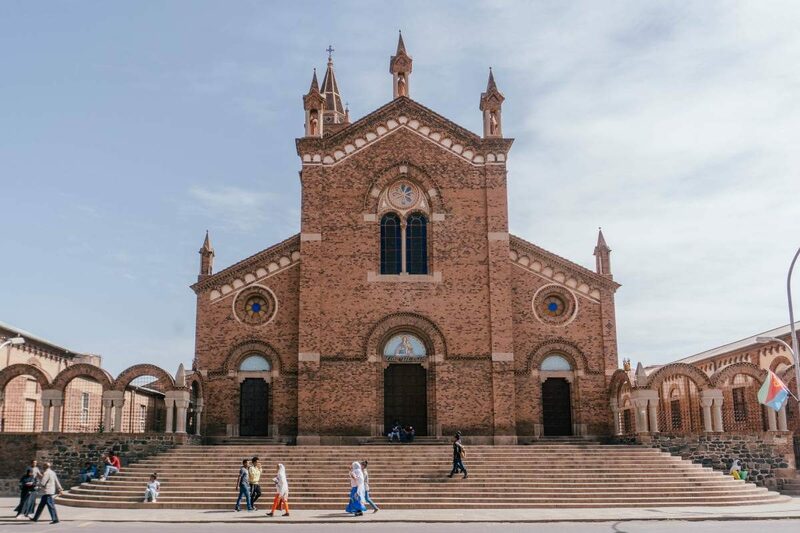 I’m not saying that I have learned everything there is to know about the country, as I barely scratched the surface, but I’m glad I traveled to Eritrea and met so many friendly locals. I’ve always felt welcomed warmly and never really felt unsafe as a visitor. If you decide to visit Eritrea try to learn about the history and resiliency of the Eritrean people.